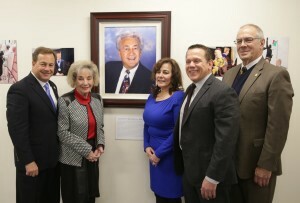 The warmth, caring and good cheer that typified the life and work of a longtime Camden County College trustee were recalled with great fondness recently when the headquarters for CCC’s student services were dedicated in his name. The Louis F. Cappelli Sr. Student Services Center was filled with family, friends and colleagues during the Feb. 12 ceremony, which took place exactly one year to the day from his passing. Family members, former students, fellow trustees, College officials and other associates recalled Cappelli’s ever-present smile, the encouragement he offered and the pride he felt in the achievements of those whose lives he had touched. Those on hand for the ceremony included Cappelli’s wife of 53 years, Patricia Dragone Cappelli; his son, Camden County Freeholder Director Louis Cappelli Jr.; and his daughter, Lynne Anne Sireci.. Among those joining Sireci in addressing attendees were CCC President Raymond Yannuzzi; CCC trustee chair John T. Hanson; fellow trustee Anthony J. Maressa; former trustee and current Bellmawr Boro School District Superintendent Annette Castiglione; former trustee and current Camden County Clerk Joseph Ripa; and former student and Congressman Rob Andrews. Cappelli was an active member of the CCC trustees from 1997 until his death at age 80 in 2015. He had served as treasurer of the Board for over a decade, chaired its Business Affairs, Audit and Campus Development Committee, served on its Academic and Student Affairs Committee and was one of its representatives to the CCC Foundation Board. Throughout his more than 17 years of volunteer service to the College, he focused on student needs — a concern he had developed during his years as principal of Triton Regional High School, president of the Collingswood Board of Education and a member of the Cerebral Palsy School and Treatment Center of Camden County Board of Directors. Cappelli also was a member and past president of both the Order Sons of Italy Lodge 494 and the New Jersey State Lodge. The Cappelli Center is located inside Taft Hall on the College’s Blackwood Campus in Gloucester Township. It houses welcome , advisement and presentation areas as well as admissions, registration, financial aid, business and records offices along with the Disability Services Office, the International Student Office, the Deaf and Hard of Hearing Program, the Garden State Pathways Program, the Student Employment Office and the Rutgers-Camden Advisement Office.